The U.S. stock market has delivered its worst month of May performance since 1940. The S&P500 index dropped 8.198% in May and fell 14.676% from the 4/26 high to the 5/25 low. 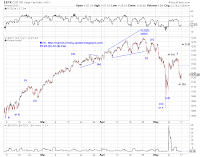 Moreover, this initial decline from the April top finally managed to take out the February lows in broad-market indices on 5/25. This development confirms that the current decline corrects a larger prior advance, at least the advance since the Mar09 low and probably a lot more. Sharp rallies from time to time notwithstanding, the sell-off is far from over whether our interpretation of a primary degree decline is on track, or if the decline from the April high is part of a larger correction. 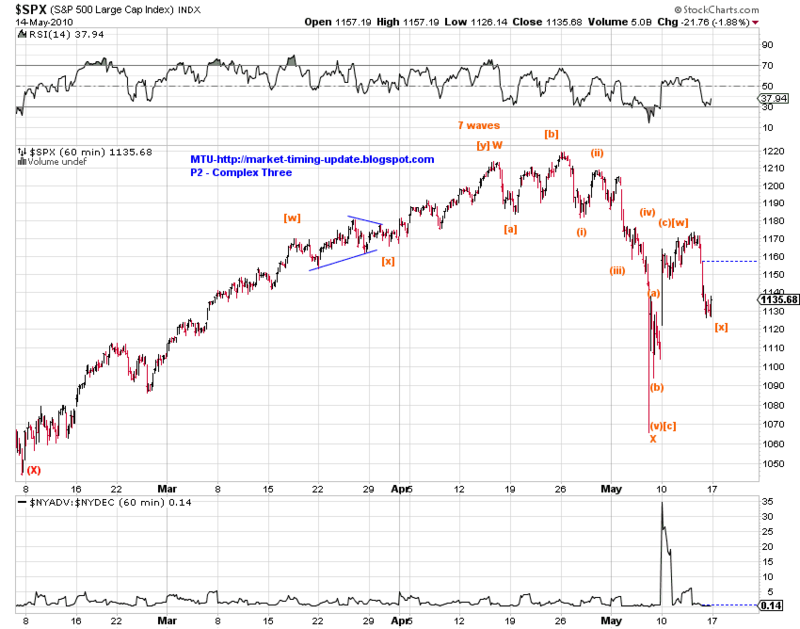 From an objective EW perspective, the 5/25 low may be labeled as one of the following. 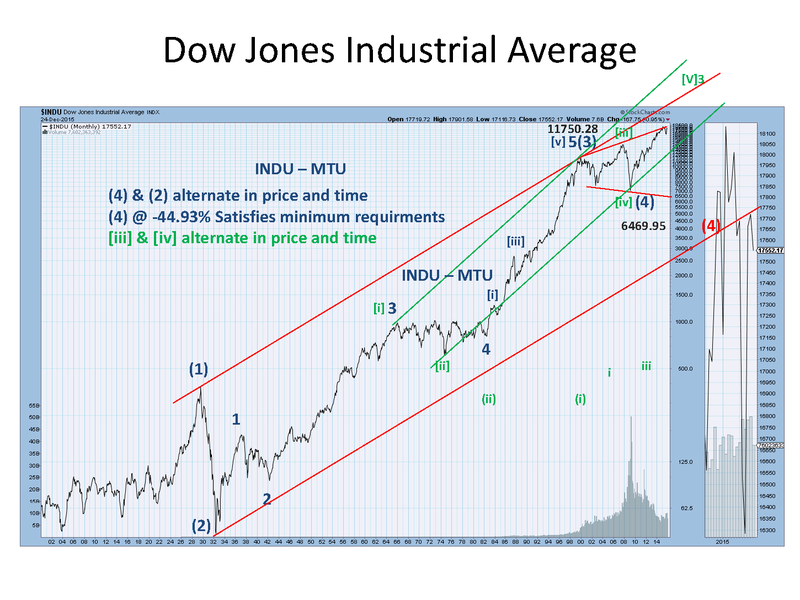 * Within the bearish primary wave 3-down count (Chart 1), wave [i] of 3 of (1) OR wave [iii] of 1 of (1) where wave 1-down is a leading diagonal OR wave 1 of (1). * Within the very bullish primary wave V(V)[III] count (Chart 2), wave W or wave [iii] of A of intermediate wave (2). * Within the moderately bullish cycle wave a of super cycle wave (b) count, wave (W) or wave 3 of (A) of primary wave [B] (Chart 3). 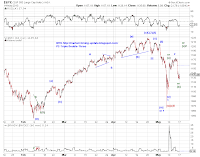 While I place dominant odds on the bearish primary wave 3-down scenario, each of the above counts also suggests that the 5/25 low is unlikely to hold. 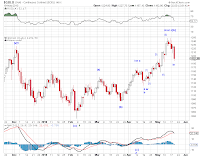 For the near term, the rebound since the 5/25 low has traced out a typical A-B-C corrective structure and has met the retracement price target and minimum retracement time target. Friday's high could be the end of the rebound or there could be one more advance before the market rolls over again. I am sympathetic to one more advance, as the initial sell-off from Friday’s high counts as 7 waves if we do not entertain more exotic wave structures (such as a 5-wave down plus an expanded flat). 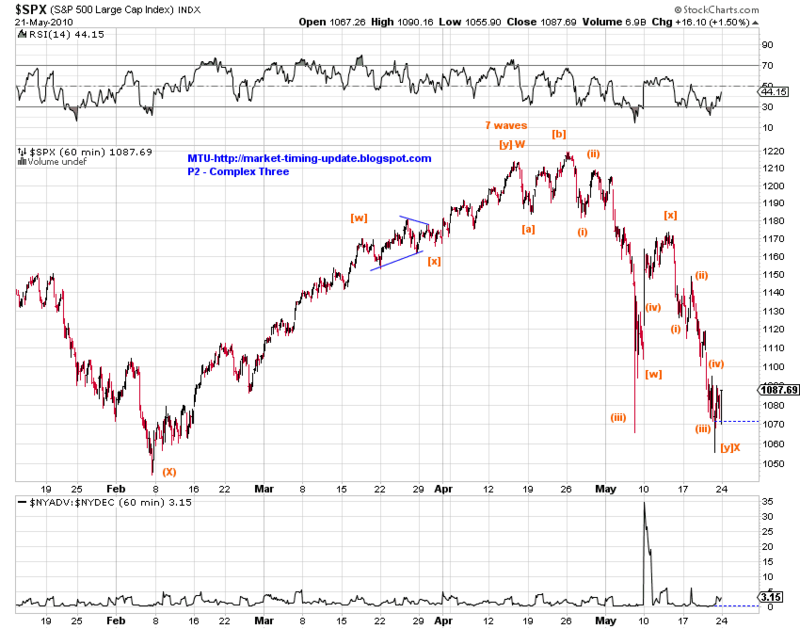 The 5/26 low of 1065.59 in SPX needs to hold if one more brief advance is in the cards. The advance could possibly challenge the 1067.26-1171.58 opening gap in the SP500 cash index on 5/21 (Chart 4). 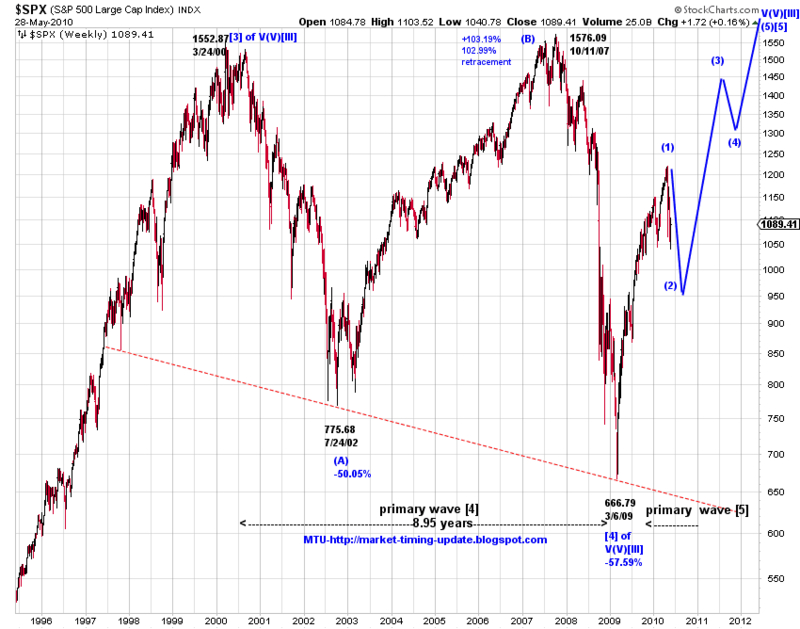 SPX/mini - Five wave up likely complete. This could be the top of [ii] of 3-down, or [iv] of 1-down, or the top of [w] of 2-up if 2-up is indeed in progress. Note the bearish divergence between price and RSI in the 60-min chart. Note that the cash index closed just below the 200-day MA, on lower volume. [9PM] SPX/mini update - Emini sub-divided lower in after hours. 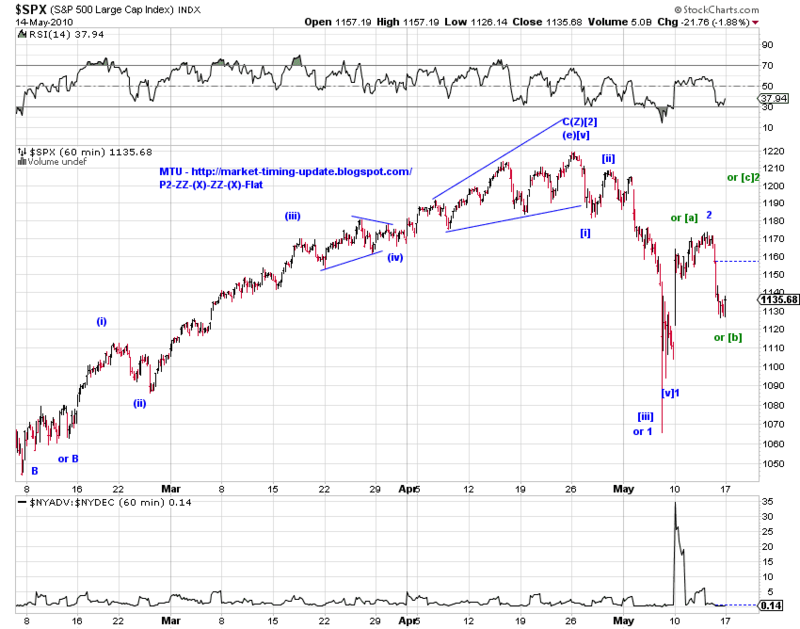 A 9-wave decline from today's high likely has completed. The whole structure from yesterday's high is likely a large expanded flat B-wave. [4PM Stocks] Counting the intra-day squiggles has been relatively straightforward for this rebound. However, price actions support several counts within the P3 framework. [red] (b) of [ii]-up of 3-down of (1)-down. 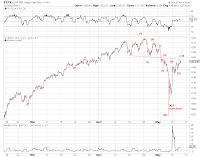 Today's low in June SP500 Emini came within 0.5 index points of the February low, and that in the SP500 cash index fell below its corresponding February cash index low. This conveniently eliminates the remaining bullish P2 count, the 7 waves up scenario, which I have kept on as an option in since the April peak. It's nice to have all top counts being bearish, at least for the next few days, weeks. This may itself be a nice confirmation of a trend change to the downside. 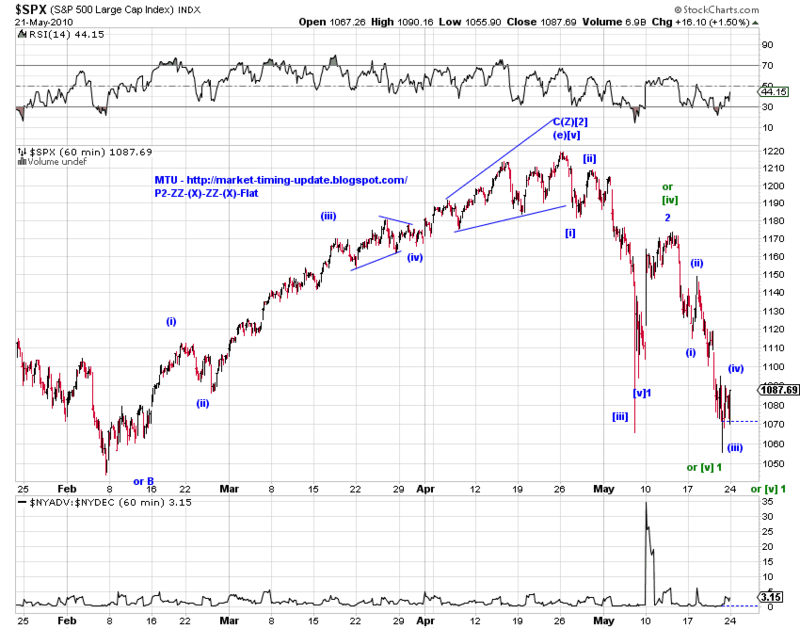 Based on market internals, the decline which started yesterday is likely a fifth wave or a b-wave. The internals within the subsequent rebound have been on the moderate/weak side so far. Again I see three logical competing counts, which are highlighted in Chart 1. I continue to focus on the E-mini actions to get the benefit of global and nocturnal participation. [Red] [i]-down of 3 of (1)-down ended at the overnight low. Wave [ii]-up of 3 of (1)-down is now in progress. Chart 2 offers a squiggle count. [Blue] Wave 1-down of (1)-down is still in progress and the overnight low is only [iii]-down of 1-down. Today's rebound is [iv]-up of 1-down. See Chart 2 for a squiggle count. Note that 1-down could turn into a leading diagonal, but is not required. At least in the e-mini, we do not have overlapping [i] and [iv] yet. One difference between the [Red] count and the [Blue] count is the upside potential of the rebound. Wave [iv] in the [Blue] count is limited by the wave [i] low, whereas wave [ii] of 3 in the [Red] count is capped by the wave 2 high, theoretically. The bearish divergence between price and RSI in chart 1 may support this count. [Green] It's also possible that wave 2-up of (1)-down is an expanded flat. 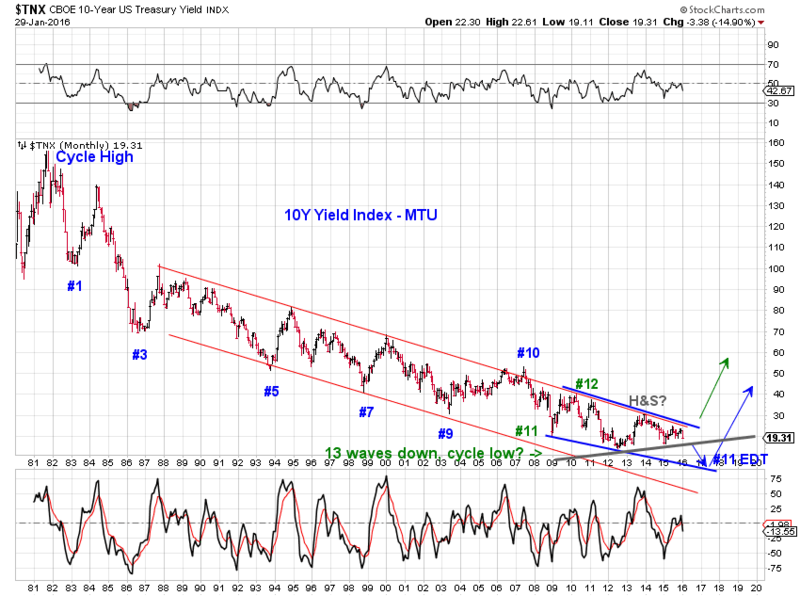 The pre-market low could be wave [b] of 2-up of (1)-down. 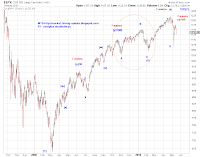 [4PM] Stocks- The most bearish count is that wave (iv)-up of [i]-down (within P3) ended at today's high. 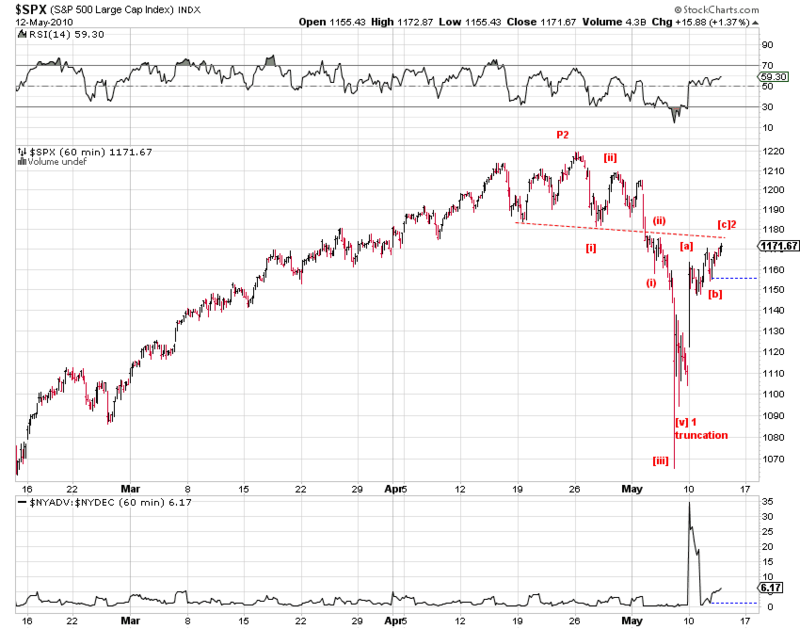 In SPX, there's a LD -down, followed by a -down decline into the close. The less bearish count is that 1-down of P3 has ended last week, and the sell-off into the close is wave (c) of [b]-down of 2-up. [b]-down of 2-up is tracing out a regular flat (especially in Emini). Price rising above today's high without breaking last week's low would shift the alt count the primary count. Please see the weekend commentary (see links on the left-panel) for details. 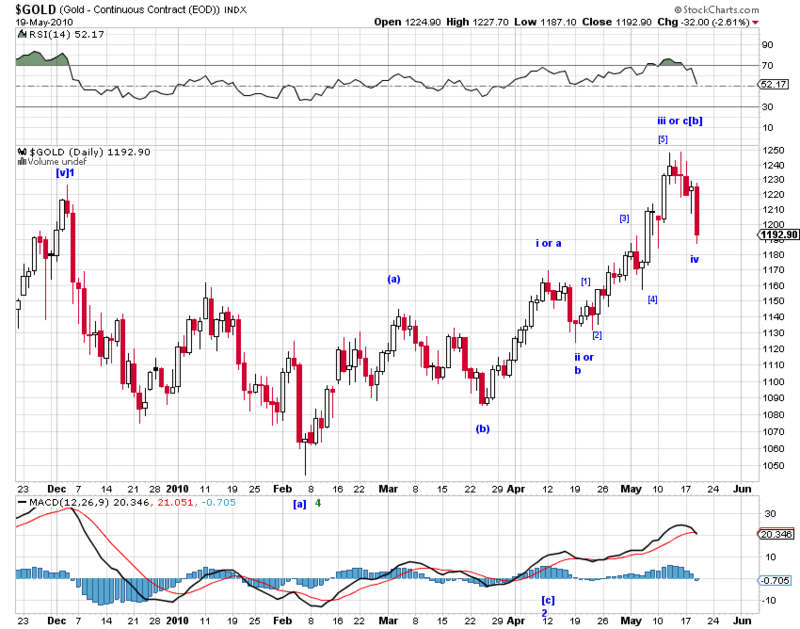 Gold - Within the bullish count, wave 4 has ended and a wave 5 advance has started. The stock market moves as if it were on a giant roller coaster. 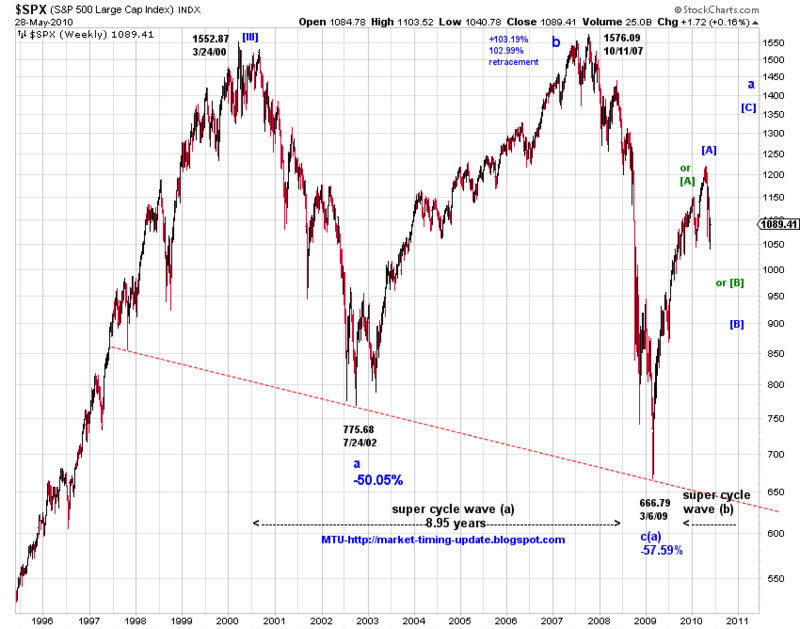 The market has now gone beyond a major zero velocity point (i.e. peak) for a second time when it topped in April, and is ready to roll over for a thrill. The energy that has propelled the hope rally since the March09 low as well as during decades of credit expansion should now fuel the hard landing ahead. 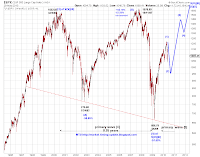 Chart 1 offers a stylized multi-year projection of the market trajectory if the outlook on a primary wave three (P3) decline plays out. This is the same chart in A Primary Degree Top (5/7/10) , now with the P3 projection shown. It should give an impressive idea of what may lie ahead, including a head-and-shoulder projection of sub-300 in SP500 to come. Speaking of bull and bear traps (5/14/10), the best gift to the bulls and the bears at the moment is either a meaningful dead-cat bounce which is far from guaranteed, or even a remotely probably new high. 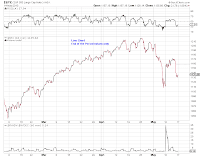 The bulls can then exit profitably and the bears can position for the powerful trend ahead. From the scale of things in Chart 1, minor wave 1 of intermediate wave (1) of P3 will likely end near current levels. 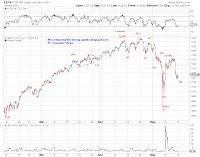 It’s possible that Friday’s pre-market low marked the end of wave 1-down. A meaningful wave 2-up rebound is near under this interpretation. However, even in this relatively more bullish scenario, the intraday count suggests that the market can use a fifth wave, (v) of [v] of 1, decline before concluding 1-down (Green labels in Chart 2). Please also refer to charts with the corresponding intraday counts on the SP500 E-mini in the Appendix. Of course, there’s no lack of more bearish counts. 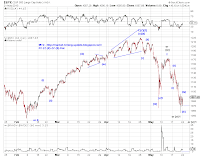 For example, the blue labels in Chart 2 says that the flash-crash is minor wave 1-down, the subsequent rebound is minor wave 2-up and the sell-off over the past week is an yet to complete [i]-down of 3-down. [ii]-up of 3-down is likely to be a shallow retracement and the more forceful [iii] of 3 sell-off will follow. In either case, next week could prove to be equally volatile. Bullish alternative counts which suggest new highs are becoming distant possibilities as broad indices threaten to violate the February lows. Chart 3 updates a complex-three P2 that may still be in progress as long as the February low is intact. 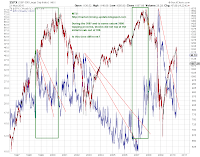 Chart 3 is listed here for the sake of completeness as well as the observation that during the 2007 and to some extent the 2000 topping process, stocks did not top at the initial break-out of the VIX (Chart 4). Will history repeat itself or will this time be different? Stocks - There is no need at the moment to change the primary count status of the P3-type of bearish count as it is doing nicely. 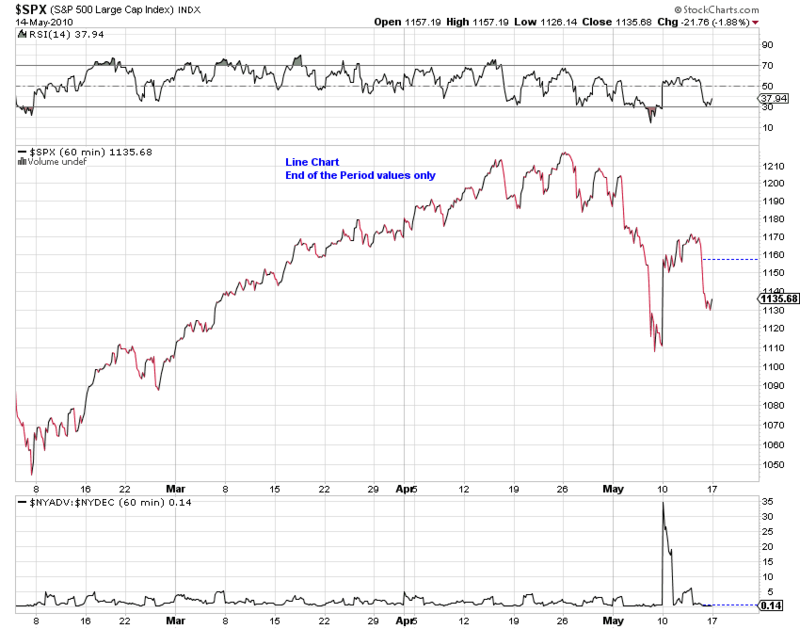 Note that at today's low, the RUT is only 2.35 index points away from its flash-crash low. It makes sense to keep the bullish alternative count on the table based on two observations, although the likelihood of the alt count playing out seems to be more and more remote. 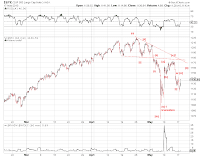 The decline since the pre-market high on 5/10/10 can be counted as a flat-x-zigzag corrective structure in SPX, until the flash-crash low is taken out. Today's decline, which contains iii of (iii) of [i] of 3, as indicated in chart 1, is not too much larger than iii of (i). Thus, if the bearish count is playing out, iii of (iii) may be extending, with the sell-off into the close as the start of  of iii of (iii), as indicated in chart 1. Gold - The decline in Gold while deeper than expected, may be corrective. If so, it would be a fourth wave of some degree. See chart. Stocks - A triple-flat correction or a series of 1s and 2s ? The following chart pretty much sums it up. The structure of the decline is either a series of 1s and 2s under the bearish P3-type count OR a correction wave which appears to include three fractal-like expanded flats. 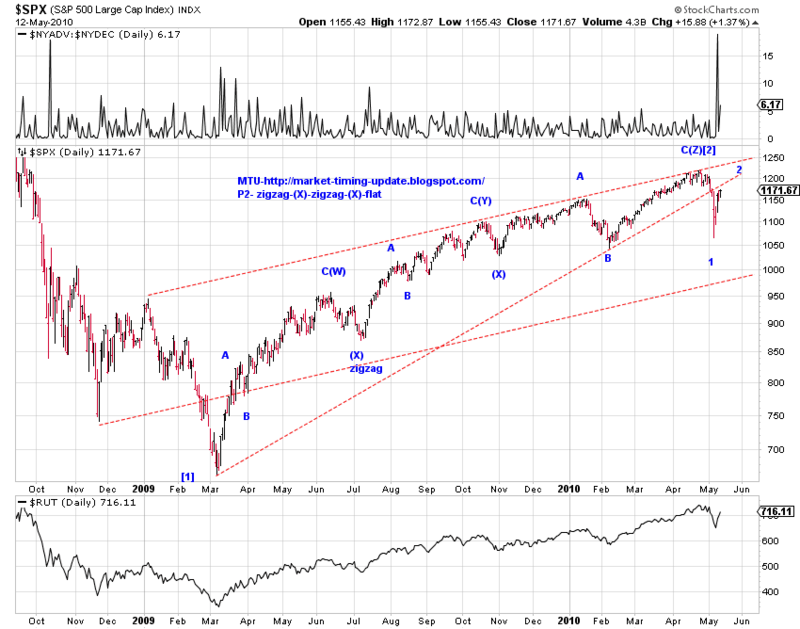 It'll be difficult to tell for sure which structure is playing out until the "flash-crash" low is taken out. However, there have been positive divergence between price and RSI at two wave degrees as indicated on the chart. Gold - also a triple-flat correction ? 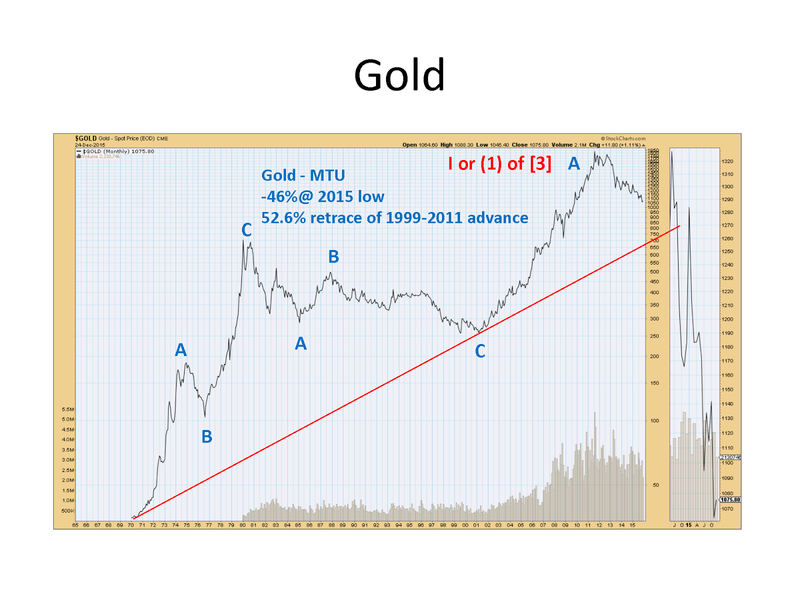 Interestingly, the structure of the sell-off in Gold resembles that in the stock market. We may also have a triple-flat corrective structure in place. The first chart below offers a bigger picture near term count for Gold where the current decline is assumed to be a fourth wave. The second chart below gives a squiggle count of the triple-flat structure. 4PM Stocks- The bearish P3-type count has been on track so far. However, the indices did not make a lower low today, which leaves a number of options on the table as usual. Chart 1 offers the big picture count. 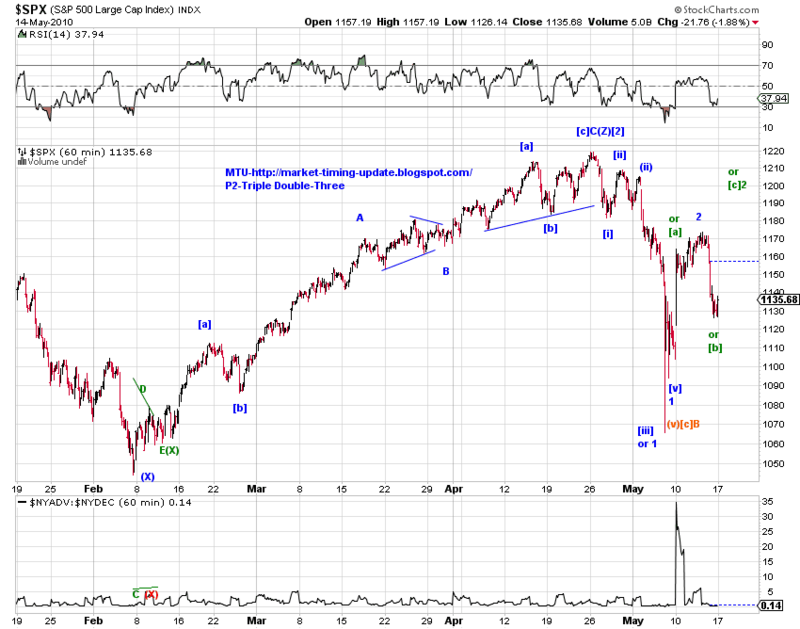 As one can see in Chart 2, the decline in SPX from today's high - potentially (ii)-up of [i]3-down - has been a zigzag (which may very well be the first 3 waves of an impulse) so far. 4PM Gold- Chart 3 and Chart 4 offer a near term count on Gold, which has suffered some volatility of its own. During the 2007 and to some extent the 2000 topping process, stocks did not top at the initial break-out of the VIX (Chart 1). Will this time be different? A number of options are still on the table. Chart 2 and Chart 3 (below) present my preferred bear(P3) and bull(P2) counts. 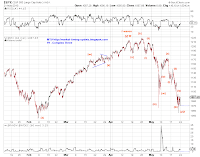 Chart 4 (right) shows the corresponding squiggle count since the April high. The preferred count is for (c) of  to conclude overnight or tomorrow, to be followed by wave  up. [First and Foremost] price actions - a decisive initial selloff which was also accompanied by a mini-crash (SP500 down 12.63% from 4/26High to 5/6Low); a sharp rebound (SP500 up 10.11% from 5/6Low to 5/13High) that has been swiftly rejected (SP500 down 4.04% from 5/13High to 5/14Low). [Second] a surge in volatility – Since the market top on April 26th, actual SP500 volatility has been in excess of 2% per day (or 32% per year) and option implied volatility (i.e. one measure of risk premium) has doubled. [Third] a worsening market and social sentiment in response to the Euro crisis at hand and to the sovereign debt schemes at large. [Fourth] a growing list of world stock market indices that have violated their Feb 2010 lows. 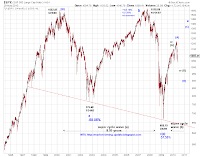 From a wave structure perspective, the best structures that mark the Apr 26 high as the end of the bear market rally are a zigzag-(x)-zigzag-(x)-flat OR a double-three-(x)-double-three-(x)-double-three , with wave B of the flat or the final (x) wave ending in Feb 2010 respectively. 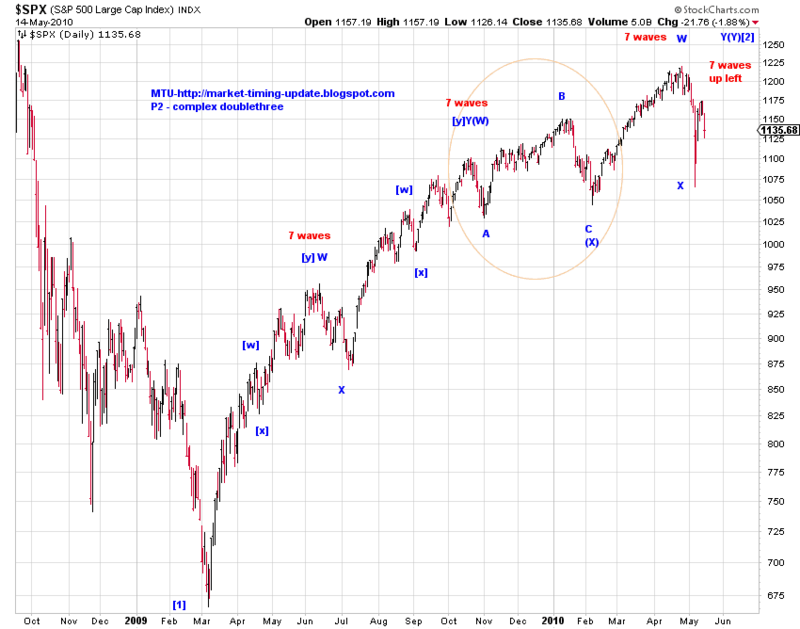 Chart 1 and Chart 2 present the wave count for each structure in SPX since the February low. 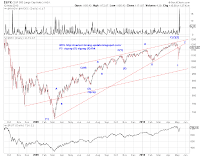 However, one has to assume an expanding diagonal triangle (which is supposed to be rare) in Chart 1, and a small B wave (compared to prior B waves since March 2009) in Chart 2. These assumptions do not violate EWP rules and guidelines but do justify for a second look. There exists a valid (complex) double three structure which call for a moderate new high to conclude the bear market rally (Chart 3 and Chart 4). The market will go where it wants to go eventually, despite government policies out of a double-down/triple-down/all-in mentality. The margin call and multiple margin calls will come. The first one is often the most difficult to time. The above scenarios present potential traps for both bulls and bears. 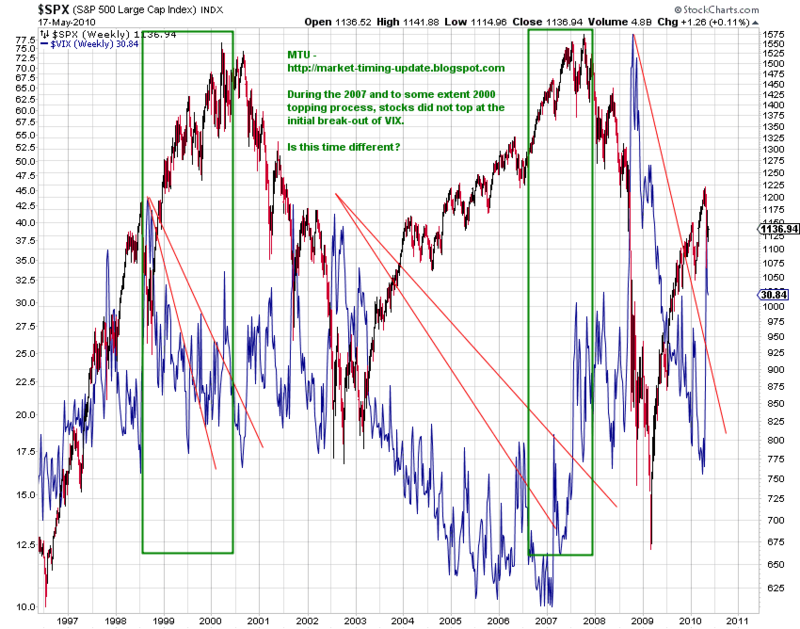 Near term, index prices have also come to levels that present potential traps for both bulls and bears. For the dip buyers, the investment landscape may have already materially changed. The mini-crash low of 1065.79 (May 6) and the orthodox low of 1094.15(May 7) and perhaps Friday’s low of 1126.14 are critical. 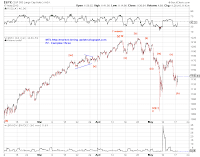 If the top is indeed in, the more forceful wave 3-down of (1)-down is directly ahead. 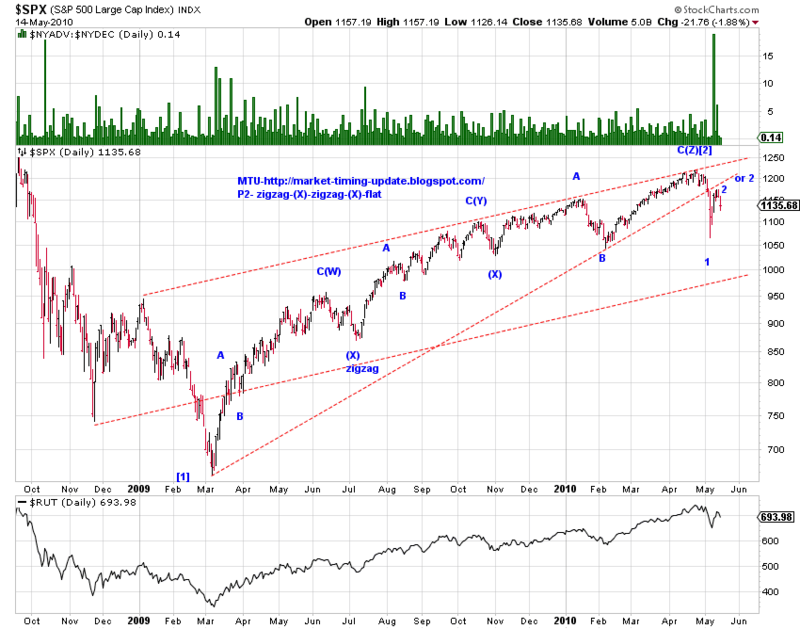 The bears need to leave some room for one more leg of wave 2 rebound since the mini-crash low. In other words, it’s possible that wave [a] of 2-up is complete, wave [b] of 2-up may be complete at Friday’s low and wave [c] of 2-up could retest the same trend line as illustrated in Chart 5. Bottom line: Today's decline looks a small-degree corrective wave. The turning process may still be in progress with a one more wave up. 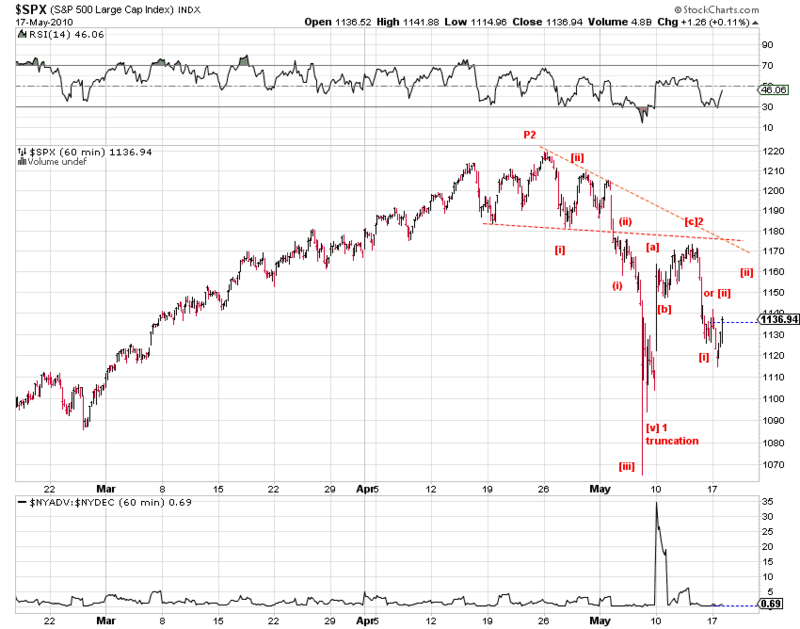 The primary evidence to label today's decline as a corrective wave is the well-defined small triangle in Chart 1, although the post triangle thrust down is larger than I'd anticipated. Chart 2 shows the top three competing near term counts with my subjective probabilities. [Green-P3, primary] Today's afternoon low is either (d) of the ED as marked, or the end of [b]-down of 2-up. If the ED plays out, expect to see wave (e)-up of the ED tomorrow with a higher high. Wave (e) should be a "three". 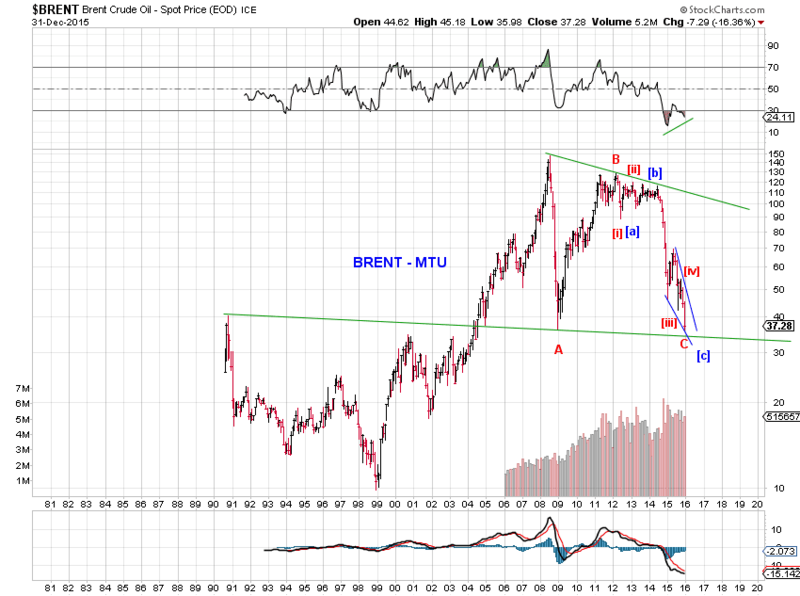 If [b] of 2 ended (or is nearly complete), expect to see wave [c] of 2 to a higher high. Wave [c] should be a "five". [Red-P3, Alt] Wave 2-up had ended at the overnight high last night/this morning. Wave 3 is in progress. It's till a puzzle to have a triangle in the squiggles though. [Blue-Final advance of P2, 7 waves up] Today's low is (b) of [y], or the end of the 6th wave. 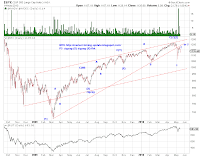 One more wave to new highs (or truncation?). 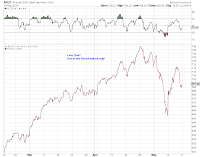 Bottom line: The current SPX levels are a good place for a turn or at least a pullback. The advance from the overnight low today best counts as a triple three. 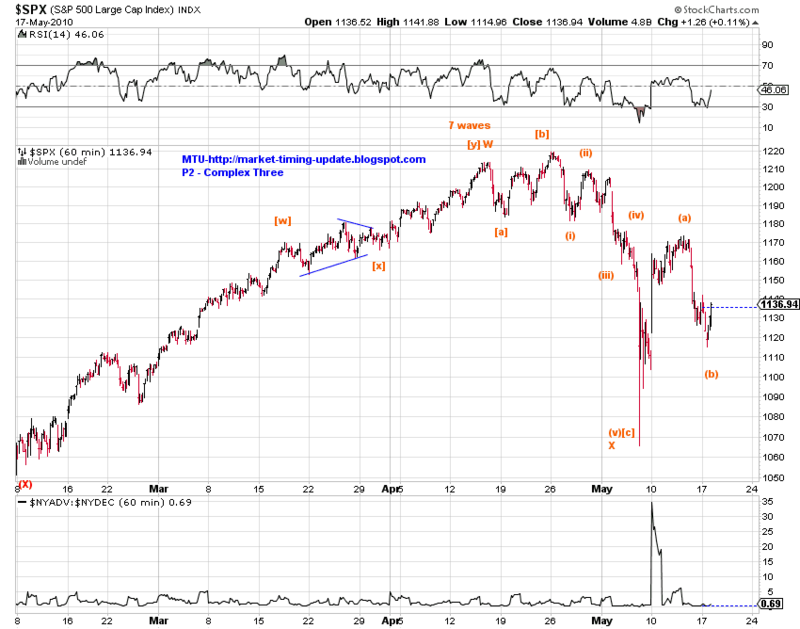 Chart 1 shows the corresponding triple-three count with a technically valid (as of 4PM EST) ED at its late stages. Chart 2 presents the top 3 competing counts. There are some minor changes in the details from the counts discussed in yesterday's update, but these two sets of counts are the same in spirit. 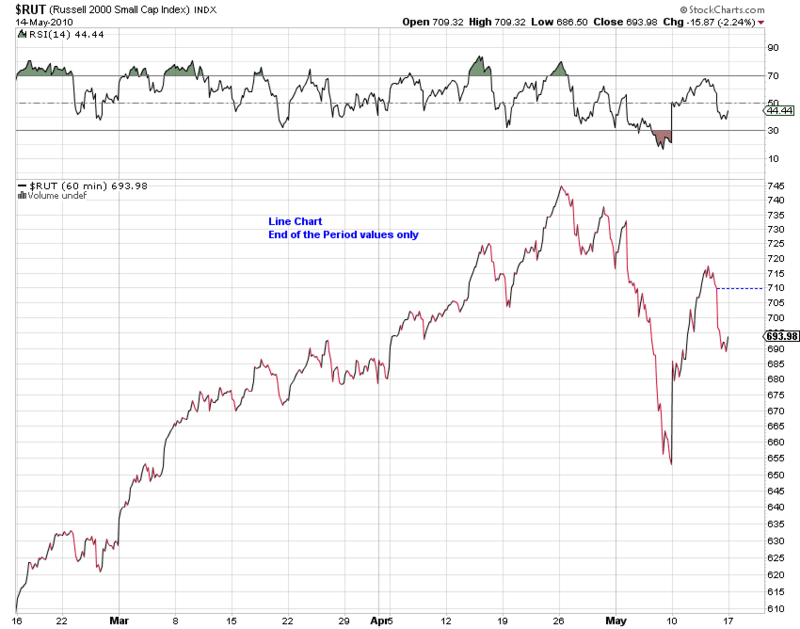 Note the negative momentum divergence in Chart 2. [Red-P3, Primary] The high on the completion of the ED in Chart 1 is likely the end of wave-2 rebound if 2-up is a double three. [Green-P3, Alt] If the wave-2 rebound is a zigzag, today's high is likely only (b) of [b] of 2. Expect an expanded/running flat or a triangle as [b] of 2, and then high highs to conclude wave 2-up. On the small chance that today's advance is instead an impulse wave, the end of 2-up may be here. [Blue-P2, final 7 waves up to new highs] Today's pre-market low is either (a) of [x] or [x] itself as labeled.